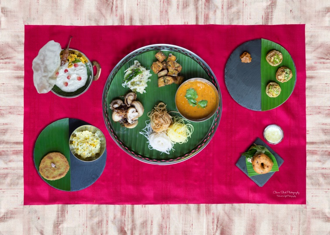 Singapore’s answer to pan-Indian cuisine, Flying Monkey, will play host to a two-nights-exclusive dinner in collaboration with Masterchef Singapore’s Sowmiya Venkatesan. On December 4 and 11, the restaurant will feature a four-course dinner menu featuring dishes curated exclusively for the two nights. diners a South Indian feast at its sumptuous best. The self-proclaimed Spice Girl dreams of opening her very own restaurant featuring authentic yet contemporary Indian dishes. With her partnership with Flying Monkey, Sowmiya will realise her dream for two nights. To Veg Out or Not – take the Challenge! Two menus have been designed for diners – a wholly vegetarian and a non-vegetarian option. Both priced at $45 per person, each of the four courses will be an explosion of traditional spices re-imagined to reflect Sowmiya’s unique cooking approach. Even for the biggest Indian food buff – dishes such as Karuveppillai (Curry Leaves) Poori, Thayir Sadam (Yogurt Rice) might leave one intrigued.